I am alive! For all of you who are emailing Gwen and Suzanne concerned about my safety! The girls and I are doing wonderfully and are so thankful for your prayers. I took a little break from blogging because I am actually working on writing a book and popped into the US for a few weeks to meet with my publisher, love on my family, and do some fundraising. If you're working on a book, you take all the time you need. I can't wait to read it:-). I'm so glad you're back! Good luck with the book. I'm so excited! You're in our hearts and prayers. I look forward to purchasing your book as soon as it becomes available... praying for God to continue to flow through the words you write. I'm so happy to hear you are writing a book. What is it about? I'll be one of the first to buy it. You have incredible talent and draw people in to your story and to the story of Jesus. I'm one of those people! Blessings to you and your beautiful girls! We (Your blogging family) don't require something moving or inspiring, just something! LOL We loved hearing about your pet monkey just as much as we love hearing about everything the Lord is leading you to do on a daily basis. Yes, your posts are challenging most of the time, but that is the beauty of it...you share your pet monkey and we trust what you say in your more serious posts even MORE. Many blessings dear sister in Christ. I only wish I could be there to give you a HUGE hug on your hard days. Thank goodness you'll be blogging more! And Woo Hoo that you're writing a book! Can't wait for that. I know I've been missing your blog and your stories. Thanks for "checking in!" Glad you are doing well. I love reading your posts! Praise God for what He is doing in your life! Wonderful to hear from you...waiting eagerly to hear more soon. oh how exciting! I will definitely buy your book girl and tell others to do so too! I have loved your entries on here and GOd has used them mightly in my life! God bless your book endeavors - I'll certainly purchase one. If the Lord hadn't given me my husband and children, I think I'd have a life a lot like your's. I'm friends with Annie's Mom - the one who adopted Peace and Charity. What a small world it can be. May He bless you and your's. Sounds wonderful! Always checking in on you! Totally excited you are doing well. I have been sharing with our Christian Camp summer staff about you. We have been talking about totally surrendering to Christ- to do big things for HIM. I shared your story, and they were sooo excited!!!!! glad you had time here and that you're back home with your girls. It is good to see a post and I am excited to see what else you have to share! You were the starting point for the deep fissure that now runs through my heart and soul for Ugandan orphans. I have something to share with you...for the kids, actually. Please come by and see. ok katie...been curious what was going on in your world. how exciting about a book!! Wow! Can't wait to read your book. That is so exciting. Good to know you are well. I almost wrote to someone worried about you but thought that would be to much so just waited it out. What is your book going to be about? How thrilling. I think a book is a FANTASTIC idea! May the Lord go before you as you write each and every page. I know he will be with you and the book will touch many lives! So glad everything is just fine on your end of the world. I've been checking in daily & praying for your sweet girls. I too had a journey like yours. I was in South Africa, but in the end I ignored God's calling, because my support from family wasn't there. Like you they thought I was crazy. Well I listened and Let me tell you after 17 years of walking away, my heart has never let go of "what could've been". My heart is in Africa with you on your amazing journey. Can't wait to hear more about your book! Waiting patiently for you to blog again - I love reading about your journey!! Oh my goodness! Can't wait to hear more...so happy to hear all is well. Whew! I was getting worried! Thanks for letting us know you are ok! Haha, book writing, international travel, missions work...do you ever rest? I just stumbled onto your blog tonight, and it helped me get back to seeing my life through Jesus' eyes. I just wanted to say thanks. I just read your April entry, and I know how easy it is to be discouraged when faced with the overwhelming poverty, death, disease, and corruption in Africa. Don't ever stop hoping, because hope does not disappoint us...He who has given you promises is faithful (Heb. 11:11), and He is able to finish the work He has started in/through you. Each person you touch is worth so much...He leaves the 99 sheep just to find the lost and broken one. This is the heart of Jesus... May you continue to see through His eyes... as you do, strongholds will fall! I know that you already know that stuff, I just felt led to speak it over you tonight :) be blessed. Thanks for posting - can't wait to read the book. I know it will be one that I will not be able to put it down. Wow! That is really exciting! I can't wait to read the book. I am praying for and I am so inspired by your blog and your story! SO glad to hear you're writing a book! I will grab it as soon as it comes out! :) Glad that your time in the U.S. was great and that you made it back safe! thats great katie!!! when will your book be coming out? i cant wait to read it! may god continue to bless you! I sure hope your book comes out soon! It will be INSPIRING! Yippy a book!! I can't wait to give it to everyone I know. I couldn't help but notice your blog on my bookmark favorites :) so I thought I would send you a little love :) It was soooo good to meet you and your family!! I hope the cup game is still a hit and not too annoying :) give the girls big hugs for me! I am praying for you all and can't wait to come back and spend some time with you all! I bought some land in Jinja so I will definitely be around you :) Blessings! Wow!! Hope your trip home went well. My husband Mark and I just got back from Jinja (at the Sonrise baby home) and it was a blessing to our hearts. I would have loved to have gotten to meet you and your crew, but hope you had a wonderful trip and that your girls did well in your absence. Katie, I love your blog. You have really inspired me to live deeply for the Lord. Katie, I was so glad to see your blog post! I check your blog almost daily and have been wondering how you all were doing. Glad to hear that all is well and even more glad to hear that you're writing a book! You write beautifully! I'll be anxiously awaiting the publishing! God bless you and your precious girls! Have a wonderful time with your family & friends in the US! Will be praying for your girls in your absence. Looking forward to your book! I have loved reading your website, and can't wait to see what the Lord will do through the new adventure of your book! Praying for your ministry, as you daily live the life we are called to live. So glad for your mini-update! Was wondering. And where do I pre-order your book at???? New things to pray about for you! Keep us posted on the book! From what I've read on this blog so far, I know God can use it for His glory. Thanks for writing this blog and reminding a college student like me that there is a great adventure out there and amazing things that God wants to accomplish in my life if I let Him. I am currently waiting (somewhat patiently) on Him to show me what possible specific mission I am called to fill on this earth (graduate next year). Till then I am trying to see what I can do for the "default" command of caring for orphans and widows and those who are in need. Hard to do financially while going to college! You and your wonderful kids are in my prayers! Stand strong in Christ and let the world know that we serve the God of Abraham, Issac, and Jacob and Elisha, Elijah, David and Job and they can too. :) Looking forward to your next post. If a break from the blog produces a book then that's fine by me! Can't wait to see that! Thank you for letting us know you are well. I'm very very excited to learn that you have a book in the works. Thank you for letting us know you are well. I'm also very excited to hear you have a book in the works. Keep up the great work! Glad to hear you are okay... do you ever allow people to come and serve with you on a mission trip? I am a homeschooling mom of 5 and would like to see what you do and help you with my oldest daughter. I just found your blog. You are an inspiration! i was praying so much for you, for strength and protection, thinking your absence was due to your very demanding life, and then recently met with some dear friends (the yates) who said you'd been back in the states!!! :) so glad all is well, and definitely looking forward to your book! praising God for the light that you are! I am trying to wait patiently for the next post. :) Can't wait to hear about everything that has happened in the last TWO MONTHS!! I realize that with all the amazing things that you spend you time doing you do not have time for blog "awards", but I am a blog reader and your love for the Lord and amazing sacrifice is inspiring and beautiful and I wanted to make sure that other bloggers would be blessed by you as well. So I posted a link on my blog to yours. Thank you for example of love, sacrifice, and service. I am so glad to hear this Katie! I have been praying for you and the girls and will continue! God bless you Katie! Wow Katie. You are truely an amazing woman! I have put the Amazima badge on all of my blogs. I also plan on donating 50% of the proceeds from my store (a small start up on etsy.com). Each time I reach $300 I will sponsor a child. This is very exciting! So happy for you. Your story should be a great anti-dote to movies like the one I watched last night that was so full of wasteful spending and vain pursuits it was embarrassing. All the best! 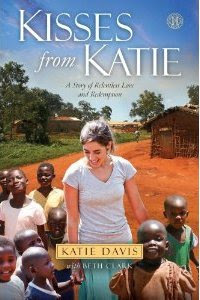 Katie- I came across your blog from a friend's facebook page and have loved keeping up with you and your ministry. I live in Birmingham and go to David Platt's church. I was reading Hudson Taylors autobiography and your blog came to mind when I read it part of the book entitled "The Missionary's Call" thought I would pass it along. My soul is not at rest. There comes a strange and secret whisper to my spirit, like a dream of night, That tells me I am onenchanted ground. Chorus- The voice of my departed Lord, Go, teach all nations comes on the night air and awakes my ear. Why live I here? The vowsof God are on me and I may not stop to play with shadows or pluck earthly flowers, till i my work have done and rendere up account. And I will go.I may no longer doubt o give up friends and idol hopes,and every tie that binds my heart to thee, my country. Henceforth it matters not if storm or sunshine be my lot, bitter or sweet my tea, I only pray God make me holy and my spirit nerve for the stern hour of strife. chorus for last verse- through agesof eternal years my spirit nevr shall repent, that toil and suffering one wre mine below. Katie, Your blog...has made me weep because..your talking about my home..we lived in Lira, UG. and worked with Path Ministries at Otino Waa...I can almost smell, taste,hear and feel everything your saying. My tears come from the depths b/c I miss the people so much. We never got to the Karamojong (sp?) but had friends down their...one lady was a vet for their cattle. We are back now in the states setting up our local church to be a sending, life-changing body. Not sure if our family will move there again someday...my kids say "yes"...just know God is asking us to duplicate our hearts and mobilize The House right now. I will be praying for you as I remember the loneliness.. but felt so close to Heaven and eternity constantly...how can you not when you are ministering and caring for widows and orphans! The people taught me so much...they understand life more than we do..they are thankful for every breath. I cannot believe you're writing a book! Well, you definitely should considering what an amazing writer you are. I wish you the best of luck and will be praying for you success. "He who considers himself religious yet does not keep a tight reign on his tongue, he deceives himself and his religion is worthless. Religion God our Father accepts as pure and faultless is this: to take care of orphans and widows in their distress and to keep oneself from being polluted by the world." I have never met you, but I am so moved by the Jesus inside you. Your heart is so full of God's love and joy! I just had to reach out to you and say that you are in my prayers; that you have encouraged and inspired me, that know that the Lord is always with you; that you are loved; that you are never alone; that greater is He than any that would try to come against you. Thank you for living out your faith in a radical, real, powerful way! Looking forward to it Katie, been wondering how you were. Still searching out what His calling for me is and the command in James 1:27. Besides giving financially and praying, I'm looking how He wants me involved. I think it would be awesome to meet you and see what God is doing in Uganda, if God ever has me come over. I struggle with the cost of travel and expenses and what that amount could benefit the children, so I need to know God's leading on these things. Praying for you and God's work there. Praise God that He is on our side and there's nothing that can be against us. So happy to hear that you are well and continuing the race towards the prize. Just learned about your blog and as a mom of two girls feeling very much called to adopt our third child, your blog is touching me at a very deep level and making me weep like I haven't in a very long time. I prayed today that my little girls will grow up to love God with courage and conviction like you.